As professional organizers, we have the great honor of walking alongside our clients during life transitions. Transitions can be stressful, disorienting, and overwhelming. But, our Order Restorers are experts at linking arms with people and helping them weather life’s changes. One of our clients recently had an unexpected move to a rehabilitation facility. Her family graciously packed up her condo and moved her belongings to an assisted living facility. Due to the rushed nature of the move and the fact that she couldn’t be involved in the process, no pruning was done ahead of time. 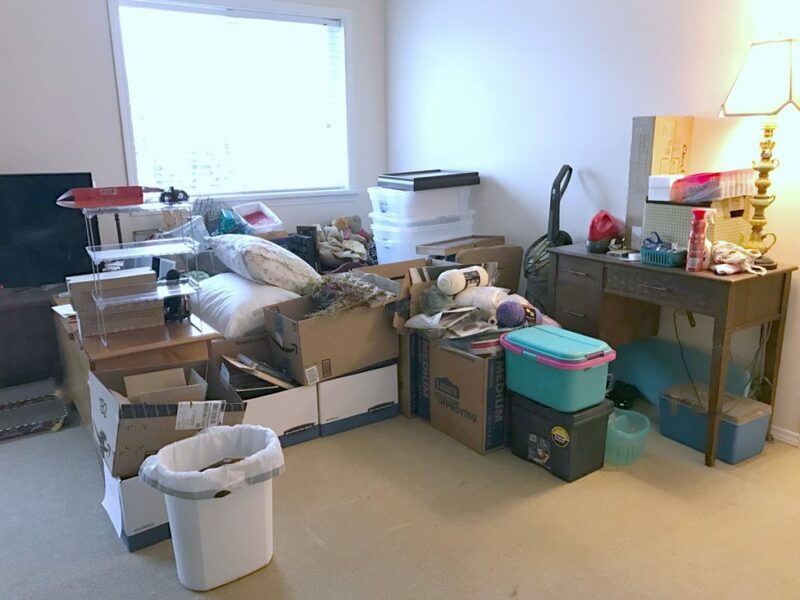 Our client found herself living among stacks of boxes, unable to get her new home properly set up. When our professional organizer was called in, her goal was to help our client maximize her new home. Our client wasn’t just in a new space, she found herself in a new stage of life! Her belongings needed to reflect her NEW season of life and environment. While providing emotional support, our organizing expert helped our client process each item and, in doing so, process the new changes in her life. Together, they went through her home and worked to right-size her belongings. In our client’s case, she didn’t have the opportunity to prune her items prior to packing them. However, when downsizing, it is best to simplify your belongings before you move into the smaller space. Learn more about how to downsize your belongings here. Downsizing doesn’t mean you must get rid of everything you love. Go through your home and make a list of all your furniture. Determine which pieces are truly meaningful to you. Keeping your new space in mind, be creative about repurposing these special pieces to bring them forward in your new home. Our client had a sewing table that was very special to her. 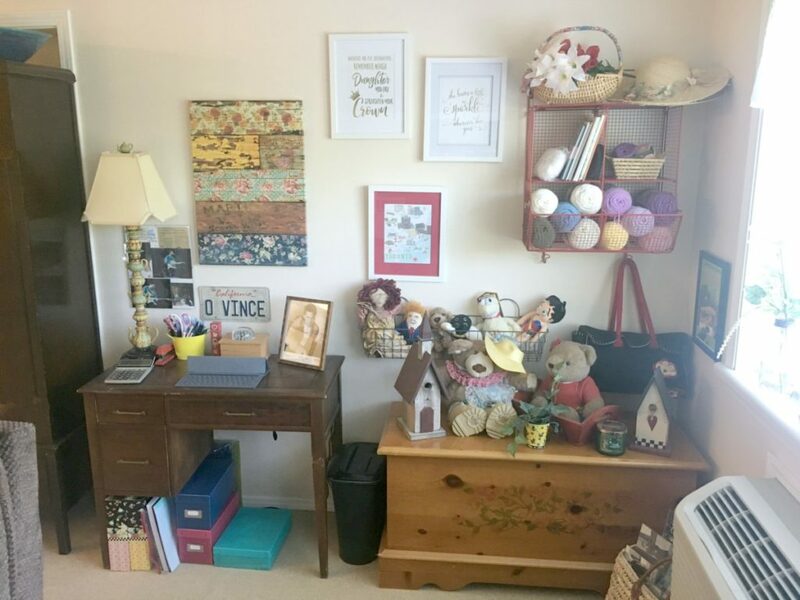 She doesn’t sew anymore, but loved the piece, so our organizer repurposed the desk and made an office station out of it. Now she has a functional space for her current life, but gets to hold on to a piece she loves. You may not be able to bring forward every piece that has value to you, but being creative in your thinking will ensure you make the most of your new space. If there are special pieces that just won’t work in your new home, consider a family member or charity that could benefit from the piece. Giving well (thoughtfully re-homing items to those who could benefit most) in a downsize can help ease the pain of letting go of beloved items. To optimize your new living space you may have to ditch the prescribed floorplan. Instead of sticking to the intended purpose of certain spaces, do what works best for you and your life. Go through the home and identify hubs and then put the corresponding items in close range to the hub. 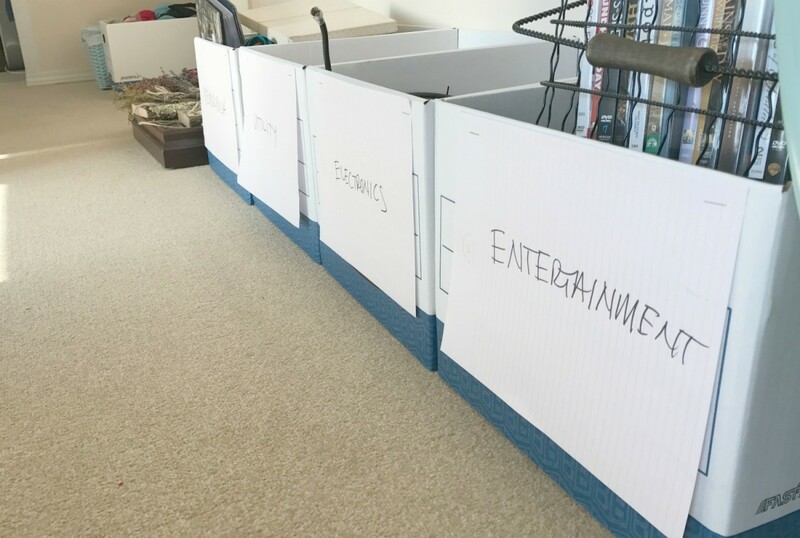 With our client, we identified the following hubs in her living room: Desk area, Craft area, and Entertainment area. Once we determined that these were important focal points of the room, we knew where to locate these types of items. Additionally, we knew that the kitchen and bathroom needed an overflow area and purposed the hall closet for this because it is in close proximity to both spaces. When you are short on space, go tall! Going vertical with storage will help utilize all available space in your smaller home. Our client had a collection of teapots that was very special to her. 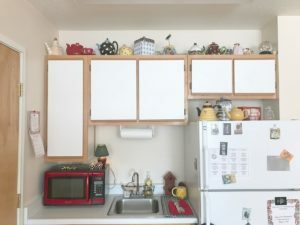 To make room for displaying these items that bring her joy, our organizer utilized the top of the cabinets in the kitchen – the soffit space. By reclaiming this space, our client gets to enjoy her collection while not taking up valuable, accessible surfaces in her home. 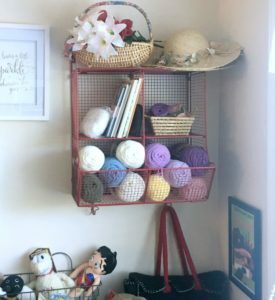 Another way our organizer utilized vertical space was by attaching baskets to the wall to hold knitting and craft items. Now they are easily accessible and serve as visual inspiration for her to work on projects. Storage space becomes a hot commodity in smaller living spaces. But, it doesn’t mean you must live with closets jam-packed with stuff. After pruning your items to eliminate what isn’t needed, sort your items by category. Use these categories to create “neighborhoods” in your storage spaces. When all items of a certain category have a neighborhood they belong to, finding and putting away items becomes easy. Evaluate your categories for what is used most often and least often. Make sure to give easy access to those items used most often. Once you’ve put in the work to “purpose” your storage space, make sure to label! 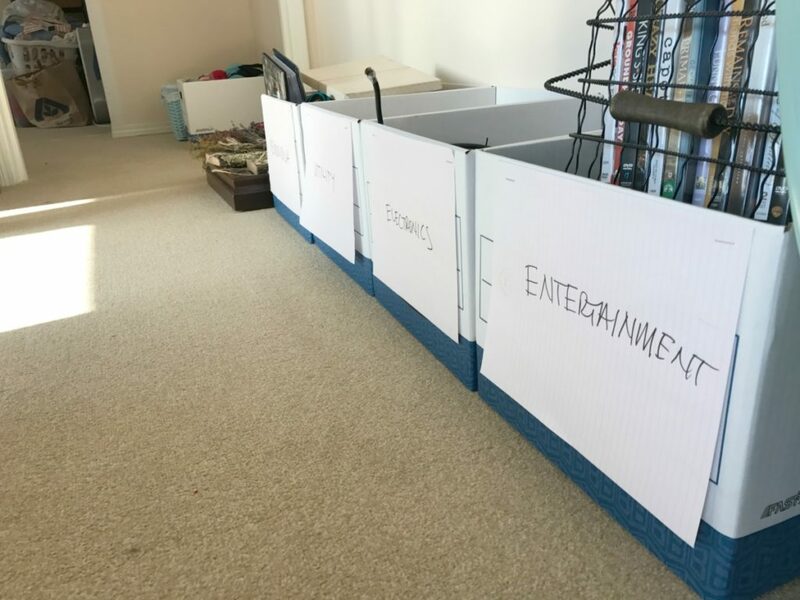 Label shelves, bins, etc to preserve the system you’ve created. 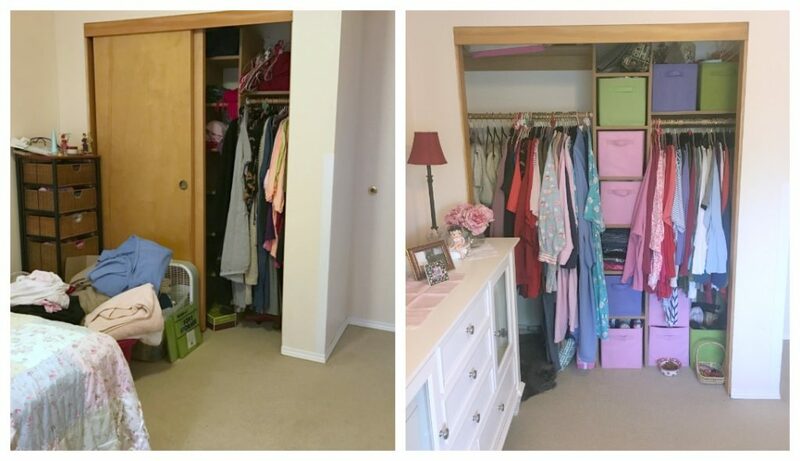 In our client’s home, we removed the doors from her closet to give her better access to her storage space. Using cubbies, we created storage zones for various belongings. Holiday items were stored in bins in her closet, but given the least-accessible spot on the top shelf because they are only used once a year. Removing closet doors and turning storage areas into accessible and attractive spaces is a great maximization technique! Our final strategy for downsizing is to partner up with a trusted party. Whether it is hiring a professional organizer or enlisting a close friend or family member, it’s important to ask for help during life transitions. Not only are the extra hands helpful, but different perspectives will be key to creatively purposing your space to serve you. 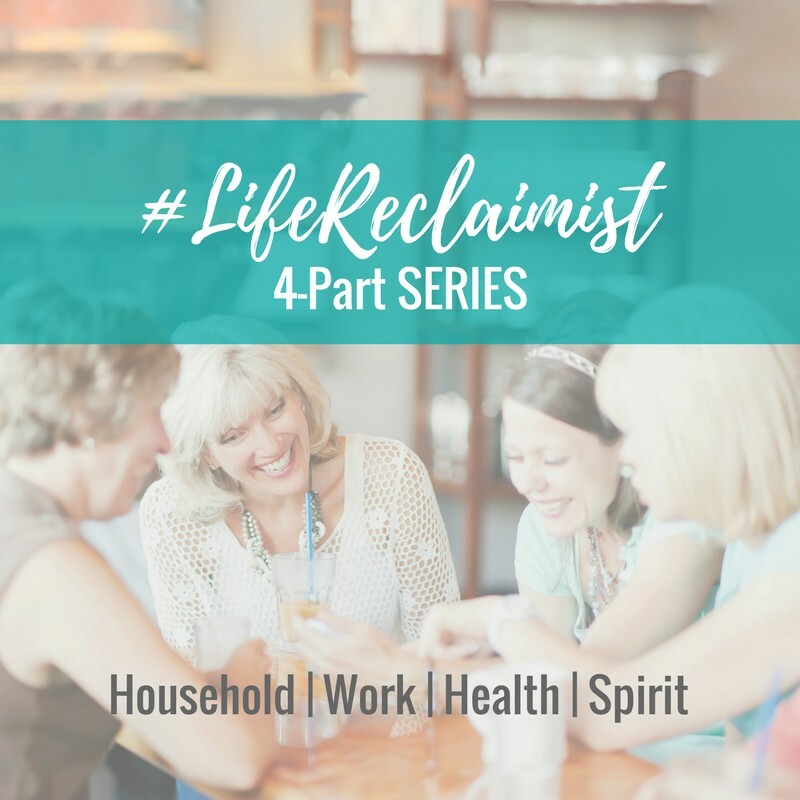 The key to being satisfied in a downsize is to be creative and intentional. It is easy to avoid making tough decisions and keeping EVERYTHING from your former life, but that will not lead you to the freedom you desire! Having a partner to help you process and make the decisions about what to bring forward into your new life will prove invaluable. Instead of thinking of it as downsizing, think of it as “right-sizing” your belongings to the life you have NOW.